Your marketing efforts should be as hardworking, responsive and data-driven as your ambitious B2B business. 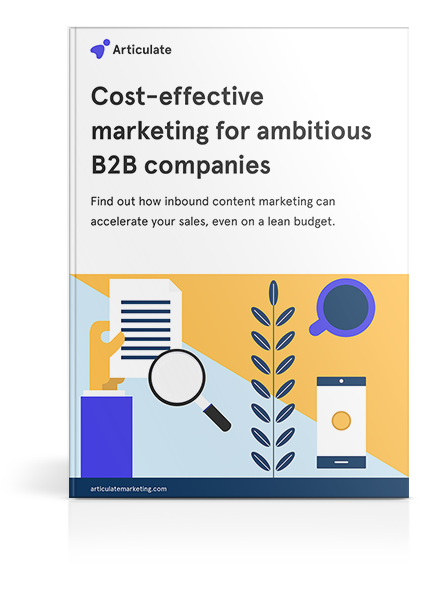 Download this free ebook to receive essential marketing insights, as well as a free marketing checklist. Paying per click is redundant nowadays. Your most cost-effective metric is now cost-per-lead. This guide teaches you how to convert those website visitors into tangible leads. Inbound marketing is about selling to people who don't know they need your product. Learn how to master the inbound sales process and accelerate your growth. A good marketing strategy is your gateway to more leads and, subsequently, more customers. This guide teaches you how to build an effective marketing strategy. Ready to streamline your marketing budget?